A Serbian TV crew was approached by a man waving what appeared to be a gun as they were broadcasting live from the northern region of the country. A local RTV Vojvodina crew was giving a weather report from the Serbian northern city of Novi Sad on Friday, when the journalists were interrupted by a man waving what looked like a handgun in front of the camera. In a video published on YouTube, the man can be seen waving his gun in front of the reporter’s face and then quickly walking away. The man continued to threaten the crew before he eventually fled the scene, according to Sky News. Tamara Bojic, the reporter, continued speaking on air despite the incident and just brushed the man off. Later, she filed a complaint to police in relation to the incident. Police is now trying to establish the identity of the offender as well as to identify if his gun was real. "The case is being investigated, including the identity of the perpetrator and whether the handgun was fake or real," Interior Minister Nebojsa Stefanovic said. "This is intolerable and we will try to determine the identity of that person as soon as possible," he added. The Friday incident was somewhat reminiscent of the murders of Virginia journalists during a live broadcasting in August 2015. 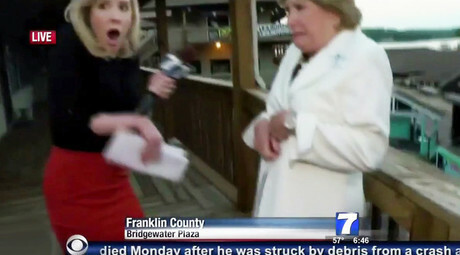 Two members of the WDBJ news crew, reporter Alison Parker, 24, and cameraman Adam Ward, 27, were killed by a disgruntled ex-employee in that incident.